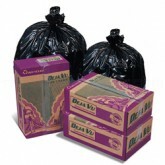 Re-Run can liners feature the highest percentage of recycled materials of any of our products. Like Deja Vu liners, they are specially formulated from a blend of our own recycled virgin resin and the highest quality post-consumer resin. 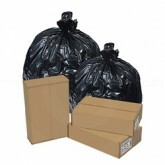 The result is an environmentally sound, versatile, and 100% recyclable can liner at a competitive price. Re-Run can liners are manufactured with up to 80% recycled content and can be used to earn LEED Credit.